Downloads, extras, and other resources for you to download and use in your own work, and your everyday. We hope you enjoy them as much as we enjoyed making them. 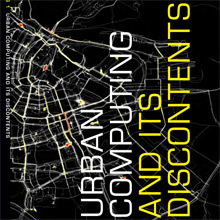 In this, the first of the Architectural League of New York‘s Situated Technologies pamphlets, authors Adam Greenfield and Mark Shepard provide an overview of the key issues, historical precedents, and contemporary approaches to designing situated technologies and inhabiting cities populated by them. For classes we’ve taught at Copenhagen’s CIID and New York’s ITP, we created custom readers, printed via Newspaper Club, in lieu of an oft-ignored reading list. With a combination of excerpts of classic texts and contemporary writing, it gave students a grounding from which to form their own opinions and project work. For a list of contents, and links to their original sources, see Weeknote 27. 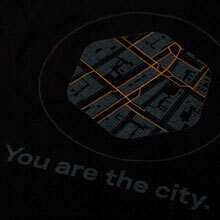 Our Year One t-shirts feature an Urbanscale roundel and the legend “You are the city” in permanently fashionable black-on-black, with our footpaths to the studio picked out in high-intensity orange. 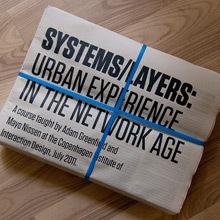 A smaller roundel and our “Design for networked cities and citizens” tagline appears in white on the rear collar. In sizes for men and women both; just so you know, the weight of these 100% cotton Next Level shirts is on the lighter side. 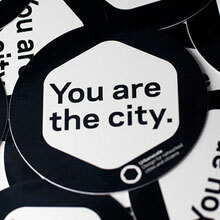 Send us a stamped, self-addressed envelope, and we’ll send you back a couple of our stickers, so you can proudly emblazon your bike/laptop/belongings/city with the phrase “You are the City.” Silkscreened with four coats of ink and three of a tough UV varnish, our durable stickers will survive extreme outdoor urban hardship for a good couple of years.